Some suggest the overthrow of the Hawai‘i constitutional monarchy was neither unexpected nor sudden. • Although Kalākaua had been elected and serving as King since 1874, upon returning from a trip around the world (1881), it was determined that Hawaiʻi’s King should also be properly crowned. o “They are naturally somewhat prejudiced against (the Provisional Government), as monarchy is the only form of Government with which they are familiar, but this feeling will quickly wear away as the Hawaiians are led to see that the Government is friendly to them and their interests. They already have confidence in the integrity and patriotism of President Dole. • Crown and Government Lands, though under the control of changing sovereigns and governments (Kingdom to Provisional Government to Republic to Territory to State,) were in and continue to remain in the ‘public domain’ for the public good. The United States does not have to acquire property only through a Treaty of Annexation with a concurring vote by the US Senate. One more correction to the many misconceptions … on January 17, 1893, the Hawai‘i constitutional monarchy was overthrown, not the Hawaiian race. Celso Caesar Moreno, a professional lobbyist well known in Sacramento and Washington, DC, arrived in Honolulu on the China Merchant Steam Navigation Company’s ship ‘Ho-chung’ in November 1879. One week later, he invited King Kalākaua, the Minister of Foreign Affairs and the Royal Chamberlain aboard the steamer to meet Fan Yau Ki, a wealthy Chinese industrialist. Moreno presented four proposals to the King. First, the Chinese company planned to establish a line of steamers between China and Honolulu, and later expand to California and Peru with the idea of securing a large share of the passenger traffic between there and China. Another of Moreno’s schemes was the laying of an ocean cable to connect the American and Asian continents. While he succeeded in getting a cable act passed by Congress in 1876, he did not get sufficient financial backing in the US. The third plan was the liberalization of Hawai‘i’s strict opium laws. He advocated making Honolulu the opium processing and distribution center for the whole Pacific. Some suggest Moreno helped ignite the flame of ambition in Kalākaua’s quest in forming a Polynesia Confederacy, a failed effort launched by Walter Murray Gibson for Kalākaua. Over in the Atlantic, Europeans were sailing close to the coastlines of continents before developing navigational instruments that would allow them to venture onto the open ocean; however, voyagers from Fiji, Tonga and Samoa began to settle islands in an ocean area of over 10-million square miles. In 1492, Columbus was trying to find a new route to the Far East, to India, China, Japan and the Spice Islands. If he could reach these lands, he would be able to bring back rich cargoes of silks and spices. For more than a century, Spain and Portugal were the only European powers with New World colonies. After 1600, however, other European countries began to emulate their example. By the end of the 16th century, a thousand French ships a year were engaged in the fur trade along the St Lawrence River and the interior, where the French constructed forts, missions and trading posts. Although New Zealand was originally settled by Polynesian migrants (the ancestors of Maori) around AD 1250–1300, links with Polynesia were lost until European vessels renewed those connections. Maori agriculture was transformed by servicing whaling ships. Forests were cleared to make way for cultivation of potatoes, wheat and maize, and Polynesians were recruited aboard American ships bound for the Pacific whaling grounds. Many of these vessels deliberately left New England short-handed, intending to pick up a full crew in New Zealand, Hawaiʻi or elsewhere amongst the Pacific Islands. The first European colonies in Oceania were Australia (1788) and New Zealand (1840.) Soon after, the French seized French Polynesia (1842) and New Caledonia (1853.) Britain, at first, resisted pressure to annex scattered South Pacific Islands; however, Fiji was taken in 1874. “The resolution concluded with an action “that a Royal Commissioner be appointed by His Majesty, to be styled a Royal Hawaiian Commissioner to the state and peoples of Polynesia …” (Kuykendall) They proposed a Polynesian Confederacy, with Kalakaua as its ruler. “Then the idea of a great island confederacy dawned upon and fascinated him (Gibson.) He discerned but little difficulty in the way of organizing such a political union, over which Kalakaua would be the logical emperor, and he (Gibson) the Premier of an almost boundless empire of Polynesian archipelagoes.” (Wheeler) “Kalakaua’s dream of empire” failed. The Polynesian Triangle is a geographical region of the Pacific Ocean with Hawaiʻi (1), New Zealand (Aotearoa) (2) and Rapa Nui (3) at its corners; at the center is Tahiti (5), with Samoa (4) to the west. The last decades of the 19th-century were a period of imperial expansion, especially in the Pacific. European (primarily Britain, France and Germany,) Asian (Japan) and American (US) were making claims and establishing colonies across the Pacific. After the British took control of Fiji in 1874, only three major island groups remained independent in the Pacific: Tonga, Hawai‘i and Sāmoa. The Euro/American powers had marked off all three of these groups as falling under their own spheres of interest. It passed unanimously and within six months Gibson became the head of a new ministry, as Premier and Minister of Foreign Affairs. Although Kalākaua had been elected and serving as King since 1874, upon returning from a trip around the world, it was determined that Hawaiʻi’s King should also be properly crowned. Then, to set the stage for the assemblage of the Polynesian Confederacy, Gibson wrote a diplomatic protest that the legislature officially approved, condemning the predatory behavior of the Great Powers in the Pacific. Kalākaua’s vision of a Polynesian Confederacy reflected a complex and multi-dimensional understanding of both the identity of the Hawaiian people and how that identity connected and allied them with a broad array of other peoples and states across the globe. It was a project that envisioned Hawai‘i as intimately connected to the Euro/American powers through the bonds of an international community built on the shared ideals of constitutional governments, formal diplomatic recognition, and the rule of law. Later, the Berlin Act (signed June 14, 1889,) between the US, Germany and Britain, established three-power joint rule over Sāmoa. This ultimately led to the creation of American Sāmoa. Eventually, the confederacy attempts failed. It part, it is believed too many changes to existing systems were proposed, many of which were modeled after the Western way. Members include Australia, Cook Islands, Federated States of Micronesia, Fiji, Kiribati, Nauru, New Zealand, Niue, Palau, Papua New Guinea, Republic of Marshall Islands, Sāmoa, Solomon Islands, Tonga, Tuvalu and Vanuatu. Later (2011,) eight independent or self-governing countries or territories in Polynesia formed an international governmental cooperation group, The Polynesian Leaders Group. 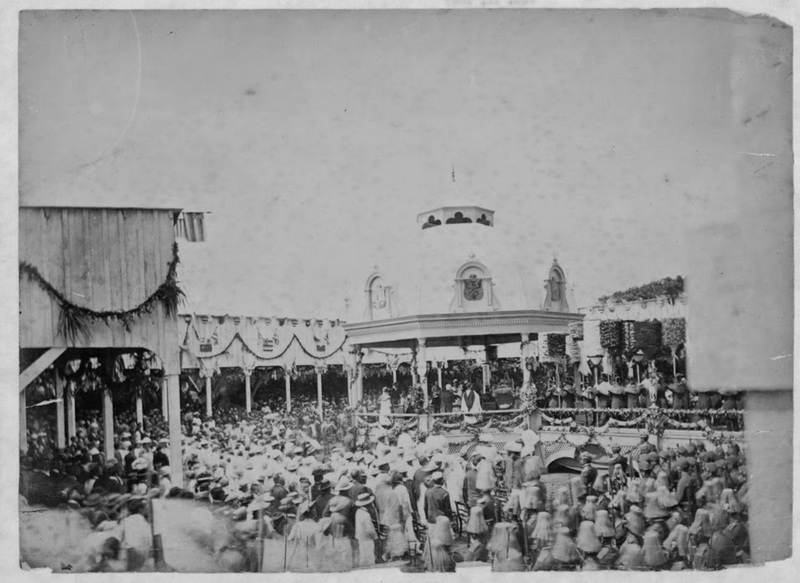 The image shows the coronation of King Kalākaua in 1883. In addition, I have added some other images in a folder of like name in the Photos section on my Facebook and Google+ pages.